Dahlia Drive » Dahlia Drive Takes One Of A Kind In Toronto! Dahlia Drive Takes One Of A Kind In Toronto! I had just the greatest time at the One of a Kind show in Toronto last March. There I launched one of my newest products, the ‘Bubble Dress’. The dresses are made out of old curtain panels and are see-through so that you can sport one of my slips, a bathing suit or whatever you like underneath. 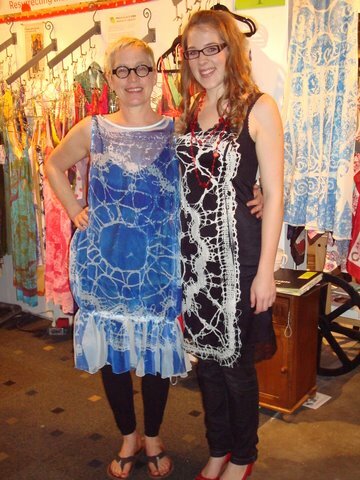 In this photo my niece Erin is wearing my new Lace design and I am sporting the new Bubble Dress.